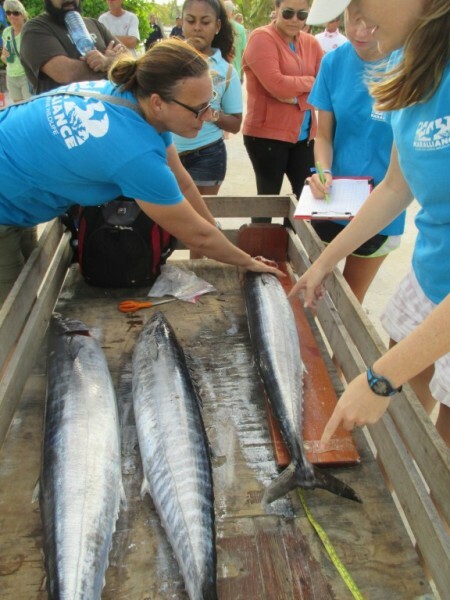 On Saturday January 31st MarAlliance, the non-profit marine research organization led by Dr. Rachel Graham conducted a full day of studies based around recreational fish species at the 2016 Captain Morgan’s Wahoo Tournament. The study, which began in 2014, aims to partner with fishermen to gather more information and build the national and regional database. According to Dr. Graham, this study is currently the first of its kind in Belize, as there are no records or information available on these fish. 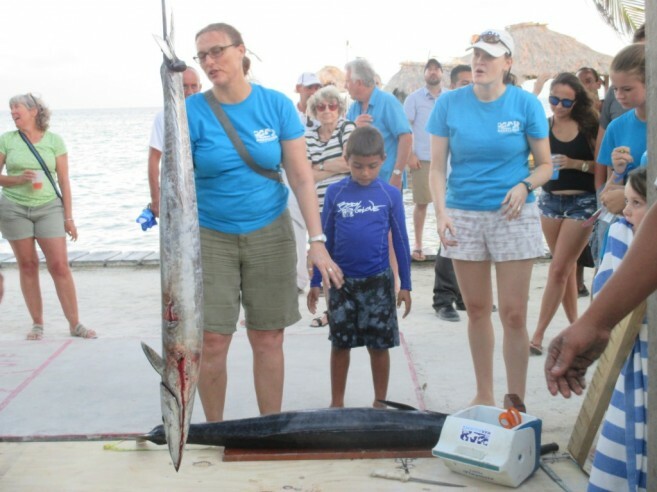 The study being done allows Dr. Graham and her team to expand the fisheries database as it relates to the diversity of game fish and the demographics on the various species often targeted in sports fishing throughout the MesoAmerican Reef and the Western Caribbean. While the team waited for the boats to come in, a MarAlliance information booth was set up and pamphlets were handed out to those spectators that came out to watch the official tournament weigh-ins. MarAlliance members capitalized on the opportunity to share a bit about who they are and the importance of the study being conducted. As the vessels docked, lead marine biologist Dr. Graham sought permission from each crew to collect small samples from each fish captured. This is important because the multiple samples allow researchers to better project a study on the population of each fish and the factors that affect its species. Through these findings, answers will be provided as it relates to whether the population of game fish are thriving, stable or declining. Information gathered included measurements; otolith extraction and small samples which will allow the determination of several key factors including age and growth rate, reproduction, habitat preferences, species accumulating toxins and contributing factors, seasonal preferences, food web dynamics, and the diet of these recreationally important fish species. So far, MarAlliance hopes to gather enough samples to send out of the country for official lab-sampling by mid-year, and anticipates the results to be ready by the end of the year. The findings of this study will be made public when available, but to keep up with the progress be sure to follow MarAlliance on Facebook. If any fisher is interested in contributing samples to the study, please contact Dr. Graham or MarAlliance at 226-3399, through email at [email protected], or via their Facebook page. The MarAlliance team thanks all captains at this year’s tournament that allowed the teams to share samples to the study.